The inspiration? The Golden Age. A time when classics like Golden Boy and Death of a Salesmen and A Streetcar Named Desire were created. A period where the psychological aspect of acting were explored. The result, a modern take on the ideals of the time. Salesmen: A Meditation on Masculinity and the American Real is an experimental series of snippets and vignettes taped together to honor the past. A past that doesn’t quite mesh with this experimental style. Conceived and directed by John Kurzynowski and created by the company, Salesmen is high in concept yet simple in structure. With very little dialogue, though inconsequential when spoken, the piece is a showcase for the masculinity and inner struggles of each of the eight actors. 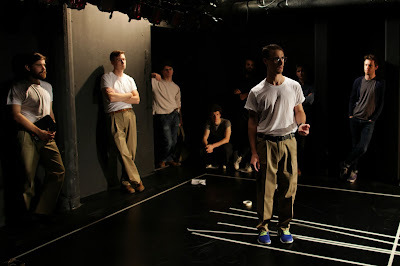 With only one actor receiving an acknowledged identity, the ensemble works as a chaotic unit, exploring the space with an abundance of calculated physicalities. Each ensemble member does get an opportunity to take the spotlight, including strong moments by Michael Barringer, Nick Smerkanich, and Hugh Trimble. The ninth ensemble member was the strong sound design by ensemble member Eben Hoffer and director John Kurzynowski. The music and soundscape aided tremendously to the repetitious movements. Director Kurzynowski does a fine job curating the world he wants to explore. The program note, which is smartly incorporated into the piece, does it’s best to explain what the audience is about to see, but just like the piece itself, it’s a lot to take in. Kurzynowski’s staging is precise. At times, it’s like watching an acting class of brilliant actors. At other times, it’s like you’re at a tennis match, you’re head is going back and forth trying to take it all in. This happens when all of the actors are doing their own thing simultaneously. You focus on one or two actors and lose the rest of the less interesting action. The two "courts" made up of taped boxes serve as the stages for the company, confining the majority of the action. Salesmen: A Mediation on Masculinity and the American Real is definitely for theater people looking to watch an experiment take shape. Don’t expect to leave changed. Go ready to watch eight actors undergo a theatrical workout.